Queenscliff is a local-government borough with an unaltered original name, ‘Queenscliffe’, on the south-western side of Port Phillip Bay, 58 km in a direct line from central Melbourne. Its area is 8.6 sq km, comprising the towns of Queenscliff and Point Lonsdale. Both face the entrance to Port Phillip Bay and Point Lonsdale is opposite Point Nepean. Queenscliff was originally named Shortlands Bluff, a prominent headland named after Peter Shortland a member of a maritime survey party (1836). A light station was constructed on the headland in 1842 and a township was surveyed in 1853. Its post office (1853) was named Shortland’s Bluff, but changed to Queenscliff in 1854, that being the official name bestowed as a compliment to Queen Victoria. A school, a church and a hotel opened in 1854, and Queenscliff was connected by telegraph to Melbourne in 1855. 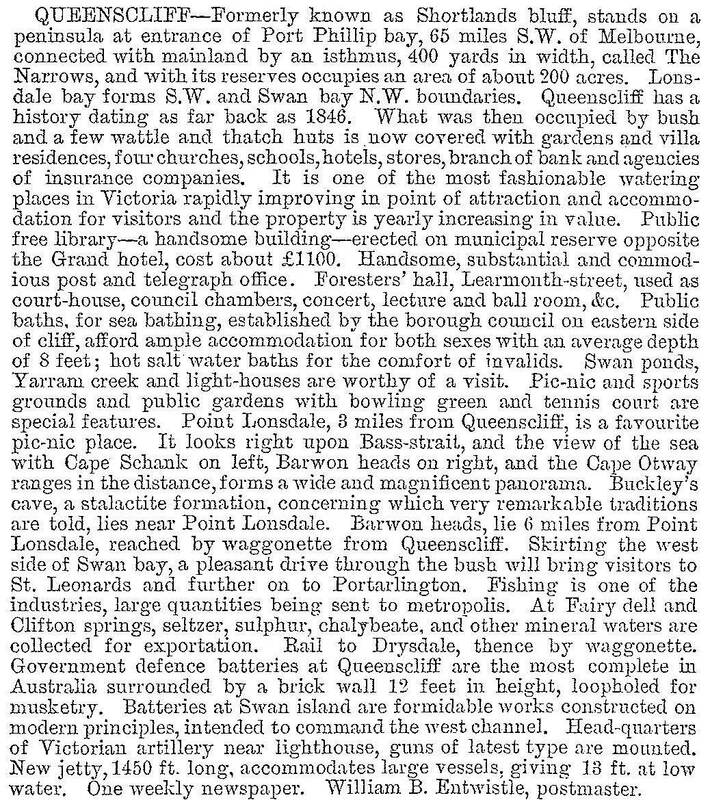 Further amenities followed, including a mechanics’ institute (1859) and a sea baths (1862). In 1862-63 three definitive guns were placed at Queenscliff as part of elaborate fortifications to protect the entrance to Port Phillip Bay. 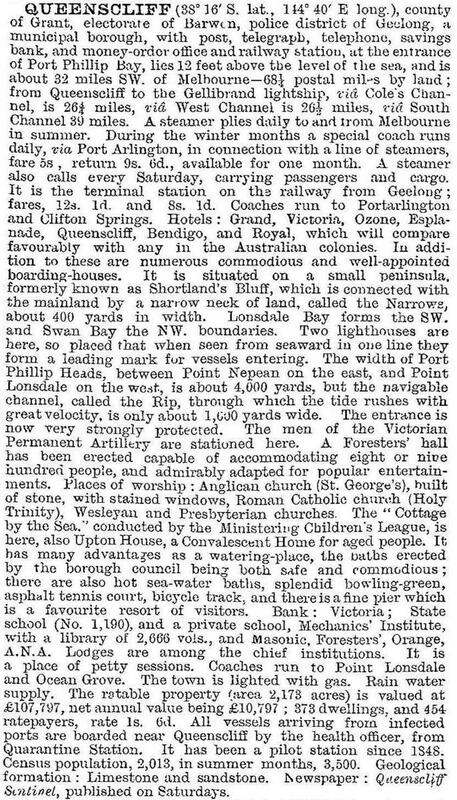 All came to fruition in the late 1880s, the main stages being a railway from Geelong for troop movements (1879), two gun batteries at Queenscliff (1880) and completion of fortifications at Queenscliff and on the other side of the bay’s entrance (Point Nepean and Fort Franklin, Portsea) in the late 1880s. A borough council was formed in 1863 and within five years there were substantially built Anglican, Catholic and Wesleyan churches. The town jetty was lengthened in 1860, a local fishing industry grew during the coming decade and the first excursion boats brought more visitors to Queenscliff’s five hotels. It was the railway, however, which brought many more holiday makers, and the excursion boats which came into their own in the 1880s. Visitors were welcomed by increasingly opulent hotels, rococo triple-storeyed buildings that held 150 or more guests. For the less well off there was a plentitude of guest houses. A lesser proportioned but elaborately detailed ‘cottage’ was opened by the Ministering Children’s League in 1890 to give seaside holidays to children in need. By federation Queenscliff had reached near completion, except for conveniences such as State-supplied electricity (1923) and sewerage (1970s). Excursion boats continued into the 1930s, but World War II saw the last of them, Wecroona, taken for military service in 1942. Guest houses continued for as long as petrol and motor cars were in short supply, and their numbers dropped in the 1950s. In 1945 a higher elementary school opened in the Church of England hall, and in 1954 moved to a new building. It became a high school in 1957, continuing until 1997 when students were transferred to Drysdale secondary college. World War II confirmed the end of fortified defences and the site became the Australian Staff College. Defence transferred its attentions to Swan Island, a low lying land mass north of Queenscliff. It is used for military training, which includes counter-insurgency conducted jointly with Australian intelligence services. Better well known are the important native-bird habitats on Swan Island, and its civilian part in the form of the Queenscliff golf club (1919). Causeways connect Swan Island to Queenscliff. Queenscliff has beaches facing Bass Strait and the entrance to the bay, all backed by foreshore reserves. Walkers along the reserves pass by the Queenscliff life saving club, the first lighthouse (1862) at Shortlands Bluff, Fort Queenscliff, the second (Black) lighthouse (1863), the sea pilots station and jetty and views across the reserves to Queenscliff’s surviving hotels. There is a second pier with a life boat shed. Facing Port Phillip Bay there is the heritage-listed former railway station, the terminus of the recreational Bellarine railway from Drysdale. The railway ended as a regular service in 1976. There is an hourly ferry service between Queenscliff and Sorrento. It departs from near the marina. Fort Queenscliff was the subject of development plans from 2013. Immediately west of the fort area there are the Queenscliff botanic gardens, adjoined by an oval, bowls and other sports venues, and a caravan park. Hesse Street, Queenscliff’s main business thoroughfare, runs north from the bowls club. It has the tourist information and history centres. To their west there are the historic churches, borough hall and State and Catholic (1916) primary schools. The continuation of the borough is a municipal anomaly. In 1993 when Greater Geelong city was formed the inclusion of Queenscliffe borough seemed to be a certainty. There was vociferous opposition to municipal amalgamation from local residents and the State government seemed to lose interest. In any event, experts predicted that the borough would not be viable and perhaps the government thought it would fall like rotten fruit in a few years. The surviving borough clocked up 20 years in 2013. At the 2011 census, the median age of the borough’s residents was 55 years (Australia, 37 years). Most dwellings are separate houses, many kept for holidays only. On census night in 2011 54% of dwellings were unoccupied. The Queenscliff primary school had 12 pupils in 2014.